Essential oils are used for a very wide range of emotional and physical wellness applications, and some might even say there are spiritual benefits. Most EOs are considered adaptogenic and are, therefore, stress modulators. They are also natural disinfectants. Consult your physician before using essential oils if you are pregnant or under a doctor's care. Using essential oils can be both profoundly simple and life changing at the same time. Working with someone who has used essential oils before will help first-time users have a more beneficial and enjoyable experience. A large amount of information is readily available for those desiring to increase their knowledge of essential oil applications. Accessing videos, books and classes are great avenues to learn about how EOs can enhance your life in a myriad of ways. A few excellent resource books that will help the new or seasoned user are Modern Essentials, The Essential Life, and Emotions and Essential Oils. EOs can be used a single oil at a time or in complex blends depending on user experience and the desired benefit. Essential oils are usually administered by one of three methods: aromatically, topically, or internally as dietary supplements. Our sense of smell influences many physiological pathways including the stimulation of hormones and other metabolic processes. Smell is commonly known to powerfully awaken memories and to create strong feelings. Essential oils are widely used in aromatherapy which is founded upon the body's predictable response to specific olfactory stimuli and how that stimuli affects the region of the brain called the limbic system. There are three main components to the limbic system: the hypothalamus, the hippocampus and the amygdalae. 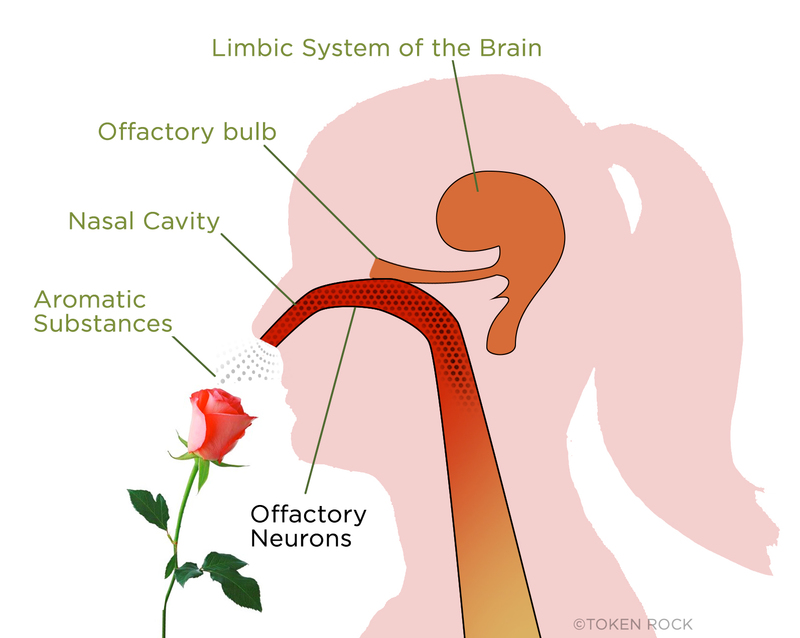 Secondarily, the pituitary, the cingulate gyrus, the fornicate gyrus, the thalamus, the mammilary body, the nucleus accumbens, and the olfactory bulb all play an important part in aromatherapy. Using particular oils repeatedly can help to reprogram or rewire habitual emotional responses. This is a profound way to find positive emotional balance. Certain essential oils, when diffused in the air, can be very enlivening while others can be calming and soothing. Beyond emotional benefits, diffusing essential oils can purify air of unwanted odors and some airborne pathogens. Water based diffusers that do not heat the EOs or atomizing essential oil diffusers are recommended as they do not change the chemical structure of the oil being diffused. Essential oils can also be used as cleansing and purifying additives to laundry and surface cleaners throughout the home. Due to their natural molecular composition, certified pure therapeutic grade essential oils are easily absorbed by the skin and can be safely applied topically. Application of essential oils can have immediate localized benefit to the target area of application. Further, it is said that one drop of EO can service every cell in the body. The chemical structure of essential oils allows them to be absorbed into the bloodstream via the skin for internal benefit throughout the body. EOs have restorative and calming properties and can be used effectively with massage and various beauty therapies. Some oils need to be diluted due to their heat. For instance, Lemongrass, Cinnamon bark and Oregano are all hot to the skin and need to be used with a carrier oil like fractionated coconut oil or almond oil. Essential oils should not be used in the eyes, inside the ear canal, or in open wounds. If redness or irritation occurs when using essential oils topically, simply apply a vegetable oil such as fractionated coconut oil or olive oil to the affected area. Certified Pure Therapeutic Grade (CPTG) essential oils can be used as dietary supplements supporting a variety of health conditions. They can also be used in powerful prevention protocols on a daily basis. Many essential oils are generally regarded as being safe for dietary use, but some oils should not be taken internally. Do not use any essential oil internally that does not have the appropriate dietary supplement facts on its label. Follow all label warnings and instructions. doTERRA International, the world's largest essential oil company, has done extensive scientific research on the safety of taking CPTG essential oils internally and orally, and has concluded that there are many health benefits to doing so. As you will see in the chart below internal use refers to taking essential oils in a capsule or a softgel form. Oral use refers to essential oils taken in water or other liquid, or under the tongue. 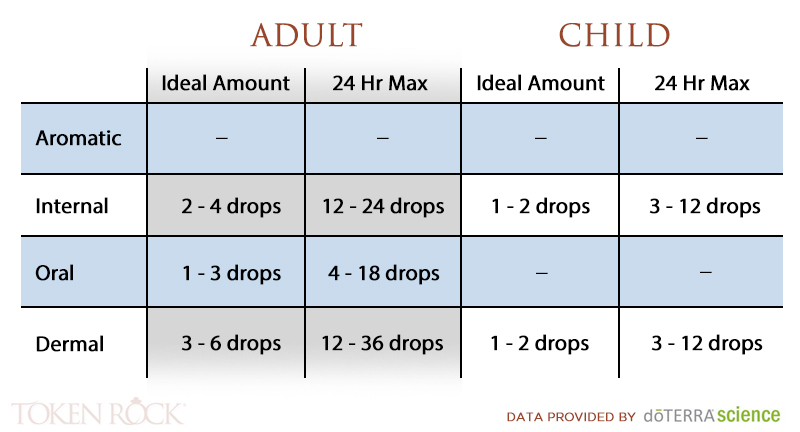 The Ideal Amount column states how much total essential oil a user should take at a time. 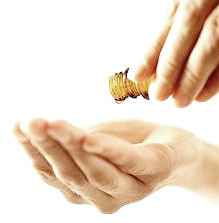 This amount can be repeated every 4-6 hours, for amounts no greater than the 24-hour Maximum amount. There is no recommendation made for aromatic use, as this greatly depends on the size of the room and other variable factors. As always, moderation is best. These are general recommendations that don't take into account the individual health and experience levels of the user. Certified Pure Therapeutic Grade essential oils are very potent and each individual will react differently to them. It is important to be aware of one's own unique health circumstances and adjust accordingly. Reminder: Token Rock does not dispense medical advice or prescribe the use of any technique as a form of treatment for physical, emotional, or medical problems without the advice of a physician, either directly or indirectly. The intent of the website is only to offer general information for wellness. Token Rock assumes no responsibility for your actions in the event you use any information herein for yourself.